NEW ROOF 2017! Immaculate and upgraded throughout! 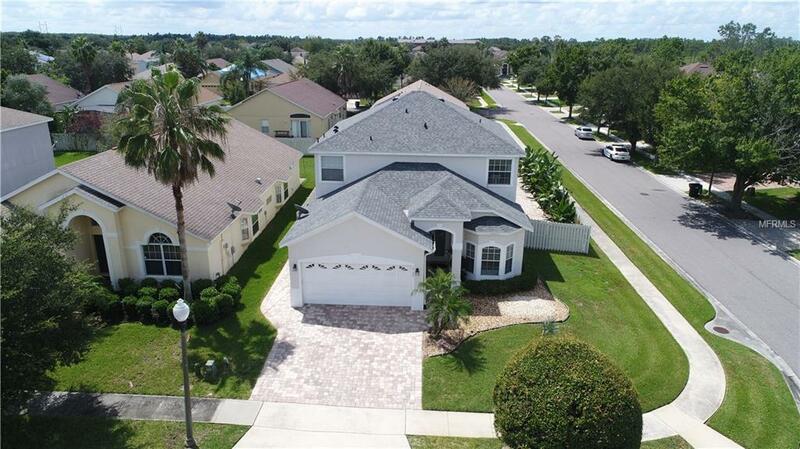 5 bedroom/3 bath pool home with lots of curb appeal. Nice corner lot, popular Engle floor plan will not disappoint! Pavered driveway leads to a beautifully tiled entryway. The eat-in kitchen features gorgeous granite countertops, beautiful eye catching back splash and overlooks the spacious family room. NEWER A/C system! HUGE MASTER bedroom! Upgraded flooring throughout, featuring ceramic tile and quality Laminate. Privacy fenced yard! Spacious pool area, with large covered deck and summer kitchen, ideal for entertaining and family activities! Interior of home was painted in 2017! Exterior was painted in 2016! This home has it all, must be seen to appreciate. Top rated elementary school within walking distance of property. Take advantage of the Hunters Creek lifestyle, one of the Top rated communities in the United States by CNN money magazine. Community activities abound, top rated schools, conveniently located between the International Airport and Disney World. This home will not disappoint. Pet Restrictions If Dog Non Aggressive Breed 30 Lbs Or Less. If Cat Must Be Declawed.Tenant Must Provide Proof Of Renter's insurance That includes Pet Coverage At Tenant's Expense.